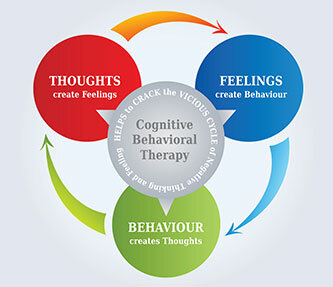 Cognitive Behavioural Therapy or CBT is an evidence based psychological treatment. Several clinical research trials have found CBT to be an effective treatment method for a wide range of problems such as mood issues, anxiety, self-esteem, stress mangement and many more difficulties. CBT looks at the relationship between our thoughts (e.g., cognitions), feelings (i-e., emotions) and our actions (e.g., behaviours). It provides us with an understanding of how our thoughts about a situation can influence how we feel and behave in that situation. CBT can provide us with the tools and strategies to target our negative or anxious thoughts so that we can mange our emotions and participate in activities that are meaningful to us.